I really need to do something about these Geese! They have been eating some of my beans which are growing close to my wire fence, as well as eating the leaves of my Pumpkin plants which I have recently uncovered. 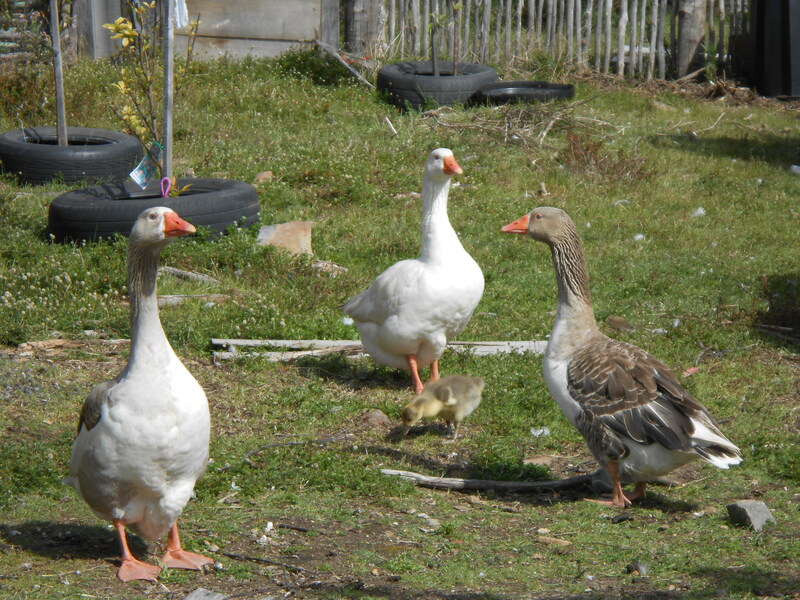 My four Geese… the little one has grown quite a bit since this photo was taken. I mentioned to a friend that I was intending to butcher the Geese last weekend. I was promptly offered $100 for a dressed Goose (Dressed means they have been slaughtered, butchered, plucked, cleaned out, and basically ready for sale… think of how you would buy a chicken from the butcher). I laughed at that price, as it is a huge amount of money to pay for, basically, an animal I am starting to think of as vermin. My friend told me that he went to buy a Goose at Christmas time and the butcher was selling Frozen Geese for $80 per kilo. As a dressed goose weighs around 4 kilos, that would be $360 for a frozen goose! I was shocked and, to be honest, I started to reconsider the value of my Geese. I told my friend that I would accept $50 for a dressed goose, to which he said he would be happy to accept a skinned one if it was easier (it is easier). I told Kitty about this price and she was blown away. Kitty, like me, does not really like our Geese. They are noisy, messy, they threaten the children. They fight each other, they only lay eggs once a year, and they eat plants which we don’t want them to eat. On discovering the value of these previously unwelcome pets, we are now reconsidering adding them to our new property (I had decided we did not want them at the new house). I am still intending to do something with my Geese… like eat them. Incase you were curious, I did not slaughter the geese on the weekend. The temperature was much too hot to be dealing with dead animals, both for comfort reasons and because it is not safe to let meat get too hot. Speaking of the new house, Kitty and I recently had to fire our Real Estate agent. There were many reasons for this, mostly due to his failure to be honest to us, his failure to communicate with us, and his decreased interest in selling our property. I won’t mention his name or which agency he works for, yet this was a decision over which Kitty and I mulled for some time. We gave him many chances to make things right yet he failed repeatedly. For the good of our family we told his manager that we were not satisfied and asked if he had another agent who would be more professional. The manager actually thanked us and told us he had another agent in mind and when he asked her if she was interested she was very enthusiastic. We will be meeting with her tomorrow and hopefully she has some great ideas on selling our home.